Neo Jazz School of Music and 504Magazine presents the 4th Annual International Jazz Day Celebration live at Sweet Lorraine’s Jazz Club. 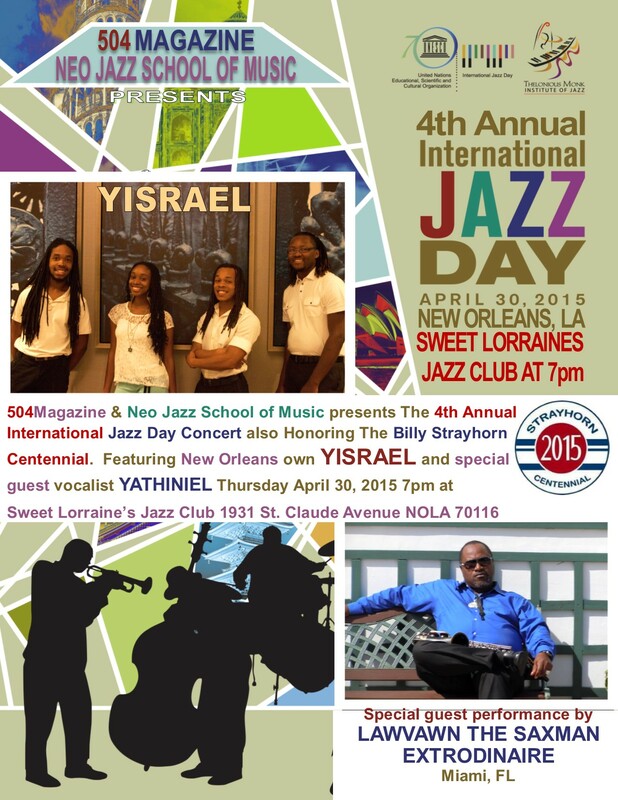 This celebration features YISRAEL live in concert on this Thursday April 30th 7pm at Sweet Lorraine’s Jazz Club. UNESCO (United Nations Educational, Scientific, and Cultural Organization) officially designated April 30 as International Jazz Day in November of 2011 in order to highlight jazz and its diplomatic role of uniting people in all corners of the globe. Last year alone International Jazz Day live performances, education programs and media coverage has reached more than 2.49 billion people worldwide. Neo Jazz School of Music and 504Magazine are in its 3rd year of observing International Jazz Day and you are invited to join the celebration this Thursday in a free concert. YISRAEL or otherwise recognized as the Yisrael Trio will present originals music from the recently released cd “GENESIS”. YISRAEL includes one of New Orleans favorite sibling ensemble Yirmeyahu on Saxophone, Yehosheba on Bass and Yah’El on Keys with the newest member of the group Terry Scott Jr. on Drums. The ensemble also features the beautiful vocals of YATHNIEL all the way from Miami FL. Check out their music and other information at http://yisraeltrio.com/.